She's Sew Crafty: Warmest Wishes! I'm back with another Tiddly Inks "Cocoa Wishes" card! I hope I don't bore you with repeat images so close together, but I find I like coloring up multiples of the same image different ways as soon as I get them. That way they are still new and fun for me! This one is a Christmas card through and through! I used the sketch from The Sketchy Challenges! I just found this blog and I am so happy as they have fantastic sketches! And a talented Design Team! I used My Mind's Eye paper pads: Traveler and Union Square. All Wild Orchid Craft flowers!! It seems I am obsessed with adding jingle bells to my cards at the moment! The rhinestones are colored with Copics, as is my image. I had it in my head that I was going to have a sweet red bird on the plate, so what did I do? I started coloring the plate with red, doh! Now I have an exotic green bird, instead! wow, gorgeous card, love the colours and layout! Thanks for playing with us at sketchy challenges! Very sweet card with lots of layers. Thanks for joining the LMM Textiles challenge. 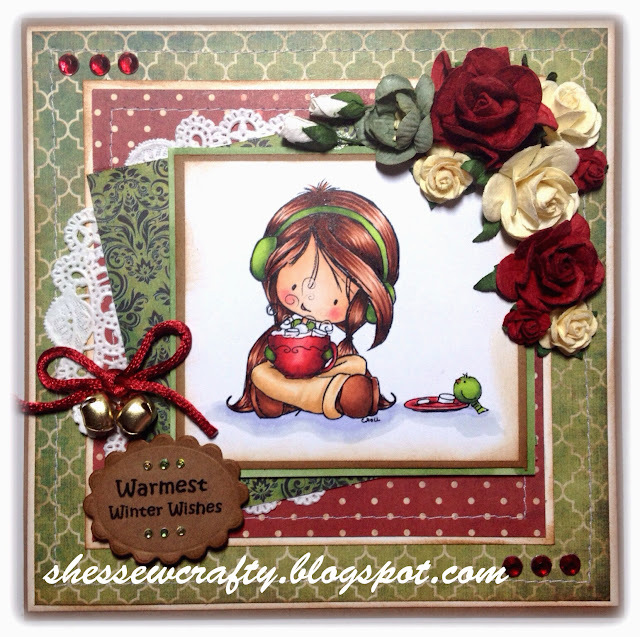 Wow, this card is so awesome, I love the coloring job as well as all the details on your card! 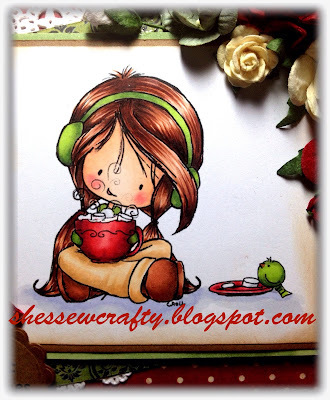 Thanks for playing with us at Whimsy Stamps!! Oh she's lovely, a very very sweet image beautifully coloured. Great embellishment work as well. Thanks so much for playing with the Sketchy Girls!